Daytona International Speedway has announced the artists that will be headlining the 2018 Country 500 Music Festival next Memorial Day Weekend, May 25-27. Scheduled to appear are Toby Keith, Chris Stapleton, Dierks Bentley, Billy Currington, Sugarland, Tyler Farr, Randy Houser, Midland, A Thousand Horses, 38 Special, Frankie Ballard, Colt Ford, David Nail, Craig Campbell, Michael Ray, Runaway June, High Valley, DJ Dirty and many more. The iconic Dolly Parton is set to bring her boundless energy and first tour in 25 years to Tampa’s AMALIE Arena on Saturday, November 26, 2016. An internationally renowned superstar, Dolly Parton has sold over 100 million records worldwide, achieving 25 RIAA certified gold, platinum and multi-platinum awards. 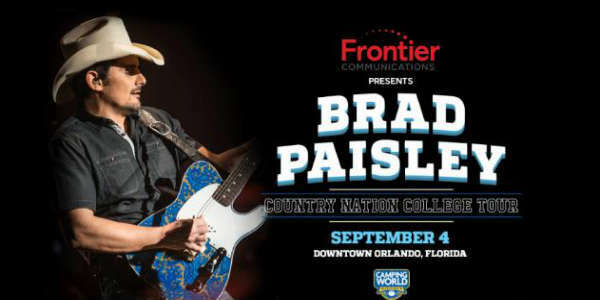 Country superstar Brad Paisley brings his annual Country Nation College Tour presented by Frontier Communications to Orlando with a free outdoor show on Sunday, September 4th. The show will take place on the grounds of City Hall in downtown Orlando. It is part of the inaugural Camping World Kickoff Weekend, featuring Ole Miss vs. Florida State in a game that kicks off the college football season. Taylor Swift, one of the hottest names in music today, has just released her newest CD, Red , and it rocketed to the top of the charts. This week, she also announced dates for her 2013 tour to support the CD, and it includes two stops in Central Florida, early in the tour. Swift’s tour, also titled RED, will first stop in Orlando on April 11 and 12, 2013, at the Amway Center downtown. The tour returns to Central Florida on April 20, 2013, with a stop at the Tampa Bay Times Forum in Tampa. Tickets go on sale November 16, 2012, for both shows. There is also one additional Florida stop on April 10, 2013, in Miami. Ticket prices have not been announced, but at Swift’s request, every show will include tickets priced at under $50. On The RED Tour, Taylor is currently slated to headline 58 shows in 45 cities in 29 states and 3 provinces in 2013. The tour will kick-off on March 13 in Omaha, Nebraska and continue through September. 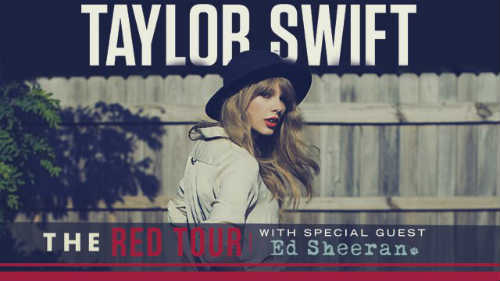 Acclaimed singer/songwriter Ed Sheeran, whose duet with Taylor from her RED album, “Everything Has Changed,” has already reached the #1 position atop iTunes all-genre Top Songs chart, will be a special guest on all of the shows on the tour. 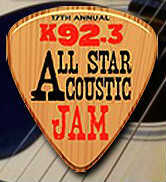 If you love country music, then you’ll want to check out this year’s K92 All-Star Acoustic Jam. Gracing the stage will be Sara Evans, Uncle Kracker, Lonestar, Thompson Square, Chris Cagle, The Farm, Darryl Worley, Summerlin Road, Jill’s Cashbox, Michael Ray, and Jana Kramer. The event takes place at the Hard Rock Live at Universal CityWalk on September 2. Doors open at 6pm and the show starts at 6:45pm. Tickets range are $39 for general admission standing and $65 for reserved seating upstairs in the balcony. You can buy onlive via Ticketmaster, or save yourself the $12 service fee and pick tickets up at the Hard Rock Live box office. This will be the 17th year for this annual radio station event, which benefits the Ronald McDonald House. 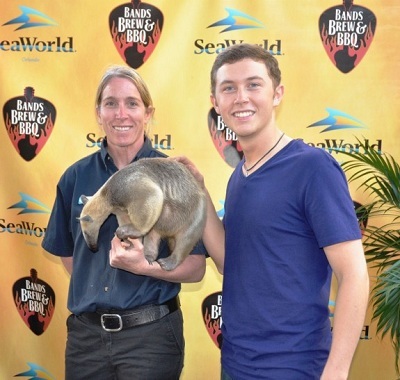 Country singer Scotty McCreery, who won the last season of American Idol, closed out the Bands, Brew & BBQ concert series at SeaWorld last weekend. While he was there, he got to check out some of the denizens of the theme park, including an anteater. Thanks to SeaWorld Orlando for the photo! SeaWorld’s Viva La Musica fest begins April 14 with a concert by Elvis Crespo. It’s just about time for the annual Florida Strawberry Festival and in addition to the yummy food and family fun, they have concerts during the afternoon and evenings. 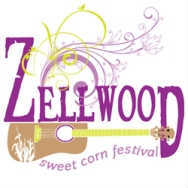 Those with a hankering for sweet corn will want to check out the 37th Annual Zellwood Sweet Corn Festival happening this weekend. The festival is being held both Saturday and Sunday (May 14 and 15, if you rely on the calendar) from 10am to 7pm. There is a major change from previous years – the corn is not included in the admission. I know, bummer, right? But there will be several vendors selling a wealth of food, including different styles of sweet corn, like boiled and grilled. You’ll also be able to get your daily fill of country music, with scheduled artists like Rhett Atkins, Suzy Bogguss, Jeff Bates, Jeff Hurst and more. This is included with admission. Admission is $10 in advance and $12 at the gate (age 13 and older), $5 for kids (6-12) and free for 5 and under. The carnival rides are separate, with daily wristbands costing $12 in advance and $15 day of. 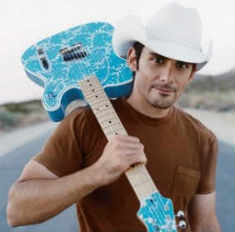 A true superstar of country music, Brad Paisley is loved by both critics and fans alike. He’s won three Grammys, 13 Academy of Country Music awards, and 14 Country Music Association Awards, among his many accolades. He’s also sold over 10 million albums and his last 12 singles have hit #1 on the charts. Back on the road, Paisley is bringing the final leg of the H2O World Tour to the Amway Center in downtown Orlando on February 24, 2011. Opening the show will be Darius Rucker (formerly “Hootie” of Hootie & the Blowfish) and Jerrod Niemann. Tickets are $27.75 and $57.75 (plus Ticketmaster fees) and doors open at 7:30pm. The only thing that makes a whole festival dedicated to one of my favorite fruits, the strawberry, better is the music line-up that appears at that festival. Today, the annual Florida Strawberry Festival announced the headliner entertainment for 2011. The line-up is predominantly country, as in previous years, but there are also a few classic rock artists set to perform. All shows go on sale on December 6, 2010, and prices will be revealed closer to that date. 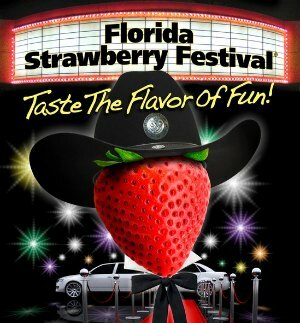 The 2011 Florida Strawberry Festival runs from March 3 to 11 in Plant City, FL. For more information on the festival, check out the festival website.